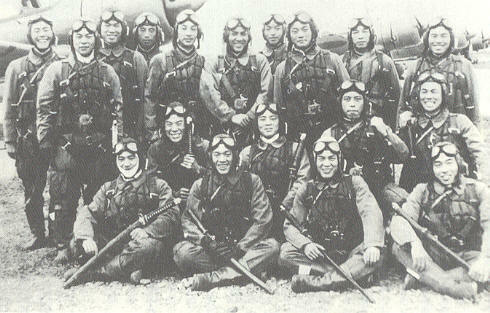 On November 6, 1944, the Army's 6th Hakkō Special Attack Squadron, also known as the Sekichō Squadron, was formed with 18 young pilots in Chōshi City at the branch of the Shimoshizu Army Flight School. All except one died in special (suicide) attacks in the Philippines. 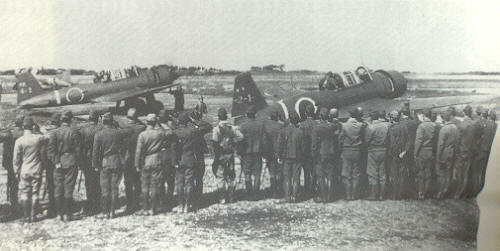 On November 8, the 6th Hakkō Squadron departed Chōshi for the Philippines in 11 Army Type 99 assault planes (Mitsubishi K-51s) with a large sendoff by school instructors, ground workers, and women's volunteer corps members. They proceeded to the Philippines by way of Army air bases at Hamamatsu (Shizuoka Prefecture), Kakogawa (Hyōgo Prefecture), Miyakonojō (Miyazaki Prefecture), Chiran (Kagoshima Prefecture), Ie Shima, Ishigakijima, and Karen Port (Haulien, Taiwan). On November 16, the 6th Hakkō Squadron arrived in the Philippines. On November 19 at Del Carmen Airfield in Luzon, 4th Air Army Commander Tominaga gave the name of Sekichō Squadron to the 6th Hakkō Squadron. Hakkō means "eight directions" or "whole world," and this name was used by twelve different Army special attack squadrons that carried out attacks in the Philippines from November 1944 to January 1945. An additional name was given to each of the twelve squadrons. Sekichō literally means "stone guts" to indicate strength. The word sekichō is usually used as part of the term tesshin sekichō, which means "iron will" or "strong determination." 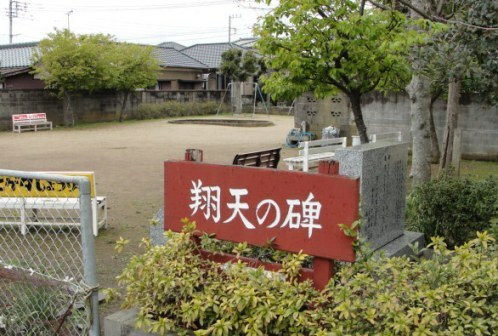 The Shimoshizu Army Flight School Branch was formerly at this location. The branch school had a small scale of about 400 thousand square meters concentrated here at Kasugadai. In the latter stage of the Pacific War, the Hakkō Sekichō Squadron was formed and departed from here never to return. With these historical facts not fading, we recall that Japan's current peace and prosperity are based on many noble sacrifices. We pray that our heartfelt desire for peace, so that such an error never be repeated again, will soar to heaven. We erect this Soaring in Sky Monument with our wish that this desire reach throughout the country from this place. assault plane (Mitsubishi K-51) carried a 500-kg bomb. 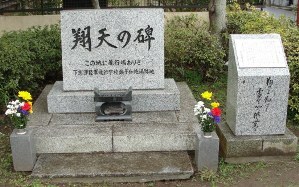 Hara, Katsuhiro. 2004. Shinsō kamikaze tokkō: Hisshi hitchū no 300 nichi (Kamikaze special attack facts: 300 days of certain-death, sure-hit attacks). Tokyo: KK Bestsellers. Background shows small park in Kasugadai residential area.